In the first mirror post (see The Two of You, August 2010) we looked into a mirror and observed that our image was reversed, left-to-right. We also observed that our image appeared to be behind the mirror's surface. Somehow, our image had moved behind the wall! Also, when trying to touch the nose on our mirror image, we could get no closer than than surface of the mirror. Over a series of posts, I will share three simple investigations that explore the relationship between an object and its mirror image. The first investigation is to have the kids simply put a mirror on top of a ruler. 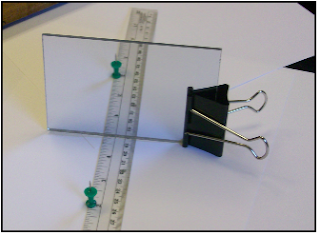 In the photo below, a mirror is set on top of a see-through plastic ruler and aligned at right angles to the ruler so that the ruler appears to extend straight into the mirror. 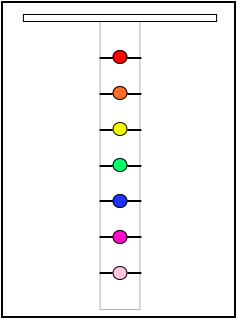 Place a small object (I used a green pushpin) on the ruler at a point three inches in front of the mirror. Ask the kids to report how many inches the mirror image’s position on the ruler appears to be into the mirror. Now have them move the pushpin, along the ruler, and tell them to watch its mirror image mimic the position of the object. Kids like color so instead of an inch-ruler, I used my graphics program to make a series of colored circles, spaced an inch apart. If you would like a copy of this page, shown below, just shoot an email to grandadscience@gmail.com and I will send you a pdf. Use the same procedure for observing object-image distances with the color bar as used for the ruler. This is how the color bar looks in the mirror. Now is a good time to talk to the kids about forming a hypothesis as to the relationship between the distance an object is placed in front of a flat mirror and the distance the object appears to be behind the mirror. It’s important that kid’s understand that the hypothesis (idea to be tested) comes from observation and experiment and is just not a wild guess or prediction. to be located behind the mirror. 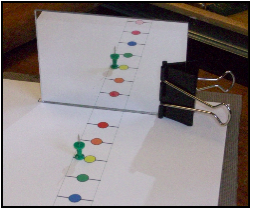 Distance is a quantity that can be measured so in the next mirror post we will discover how two pushpins and a ruler are used to test the hypothesis. This post motivated me to read again Lewis Carroll's Through the Looking Glass in which Alice, of Wonderland fame, steps into and behind a mirror. The best version of both tales is found in The Annotated Alice, by Martin Gardner. Gardner's notes to the text illuminates the math and science (Carroll was a mathematician) that fill the background in the stories. A game of Chess directs the action in Through the looking Glass and Alice confronts a host of marvelous characters like the mirror-image twins, Tweedledee and Tweedledum. I recommend adding Through the Looking Glass to the kid's library as it is literature, and, if you get Gardner's annotated version, learning the math and science connections makes a classic even better. Here's a short animation I made that will summarize the object-image relation in mirror reflection.